The OXEDOS Food Truck serves college campuses in the Boston and northern New England areas and made a visit to Plymouth, NH on Saturday, May 5th. 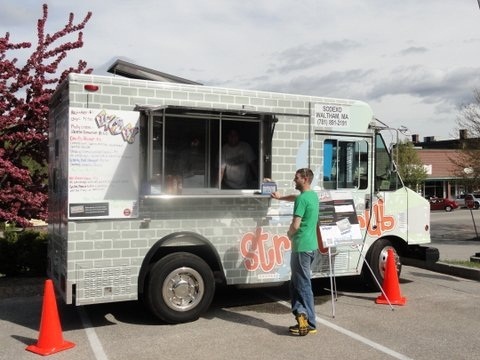 The OXEDOS Food Truck visited Plymouth State University for its annual “Spring Fling” event. When first looking at the word OXEDOS it seems hard to articulate, but given the literal translation of [ek-suh-duh’s] and the definition: “a migration of city-style street foods to college campuses” the name becomes much clearer and is actually a very clever play on words. PSU students were fortunate to have the OXEDOS Food Truck parked on campus until late in the evening where they could sample delicious sandwiches from the limited, but tasty menu items. 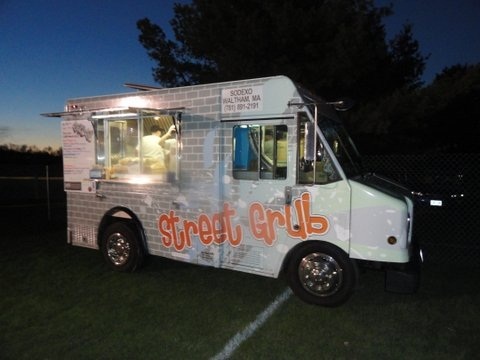 Prospect Dining Hall was closed Saturday evening and students were encouraged to enjoy a meal on the town or at the OXEDOS Food Truck as part of their meal exchange option. Some of the delectable fare that students enjoyed included a classic Grilled Philadelphia Steak & Cheese Sandwich, a Liberty Bell Hoagie made with Sausage and Peppers & Onions and a Devil’s Pocket, which consisted of shaved Corned Beef, Swiss Cheese and Sauerkraut. For the vegetaria n population, there was a Veggie Quesadilla with Roasted Vegetables, Black Beans & Pepper Jack Cheese or a Grilled Peanut Butter & Nutella Sandwich from which to choose. We hope to see the OXEDOS Food Truck back in this neck of the woods at a date not too far in the future!